A band from Texas that are heavily influenced by the occult. They describe their sound as “friendly cult acolytes” and I think it’s a fair assessment. Nothing on the tape is too polarizing or terrifying for those listeners, myself included, who aren’t into or knowledgeable of cultic music. Their music includes a lot of chanting, a wide variety of both Western and non-Western instrumentation, various electronic elements used in the production to further distort the sounds/voices, and a hint of psychedelic sprinkled on top of it all. 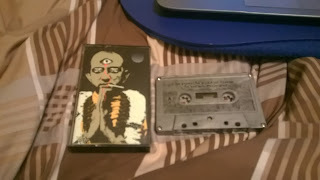 If you’re into that sort of thing or are just intrigued by it, consider picking up a copy of their tape.